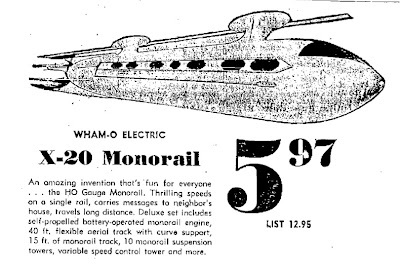 This ad in the December 14, 1962 Albuquerque Journal (Albuquerque, NM) shows the X-20 Monorail toy, selling for $5.97. An amazing invention that's fun for everyone . . . the HO Gauge Monorail. Thrilling speeds on a single rail, carries messages to neighbor's house, travels long distance. Deluxe set includes self-propelled battery-operated monorail engine, 40 ft. flexible aerial track with curve support, 15 ft. of monorail track, 10 monorail suspension towers, variable speed control tower and more. Those of you intrigued by the half turtle, half frog, Odd Ogg can read more about him at Older Than Me. Even adjusting for inflation back to 1962, how many customers do you think really needed a layaway plan instead of shelling out $5.97? For a sofa or TV, sure, but a toy? Layaway was common then even for an item like a toy. I remember my mother putting a toy on layaway for me once. Remember that most people didn't have credit cards then and, for those that did, there were far fewer places that accepted them.